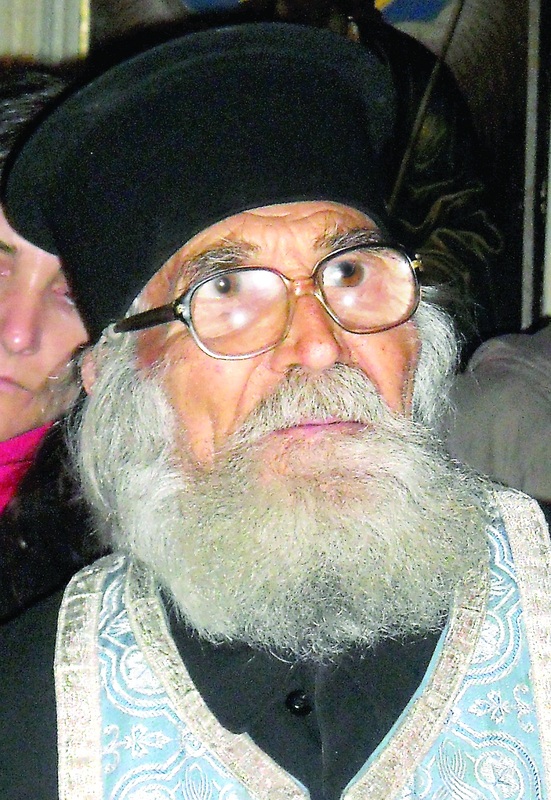 Father Atanas Arolski A Notable Priest and Spiritual Father Elder of Bulgarian Lands and Bulgarian Orthodox Church passed away to Christ aged 95. fr. Atanas was born in a small Bulgarian mountain village Hvoyna located in Middle Rodopis Mountain. The priest is famous because he was among the few priests of our faithless times that walked by Rodopi Muntain villages all their life to preach the Gospel of Christ. 70 years of his earthly life was dedicated to God's word and priesty service. Fr. Atanas Arolski is born (by God's providence) on 1st of November on the day of Bulgarian Christian enlightener saints St. St. Kiril and Methodius who preached the Holy Gospel Good news of Salvation on Bulgarian lands in the 9th century. And just like the two Thesaloniki brother saints Cyril and Methodius fr. Atanas was enlightener of the Bulgarian nation during all his life. fr. Atanas completed his church studies succesfully in the Seminary of Cherepish "St. John of Rila" in year 1939. Though a lot of the Seminary students choose to become deacons in the Church to escape the mobilization and army service in Second Wolrd War the fr. decided not to cheat and went for a military service. He was ordained priest in 1943. During the last years of his life even when 90+ years old he walked to Malevo village (3km away) from his village and Orehovo village (7km! away from Hvoyna). Its interesting that the father walks to the 3 village Churches where he was assigned to be serving Holy Liturgy and do his many Church duties daiy even though he has a driving license since 1961, however he alone says until this very date he failed to find money to buy a car (because of his humbleness) in order to hide the spiritual reason behind that. The most notable father saying is "Man alone Opens or Closes the Door to Heaven" and his life is an example on how one can open the door to heaven and open when the Lord Jesus Christ knocks on the door of our heart. This priest was torutred severely by the Atheist authorities during the Communist rule in Bulgaria in their attempt to convert him to atheism but fr. Atanas stand firm being a true confessor of Christ as he explains in the short video below, on many times they bring him in police and he was beaten badly with the purpose to show them there is no God and convince them to decline his faith in Christ and the Church but he refused. Many times to make him stop going to Church and serving Holy Liturgy the authorities threatened him that he will be sent as a political Prisoner to Belene and he was imprison for a time and beaten to death but with God's help he survived. In his standing firm for the Church and faith even in times where this was not possible fr. Atanas resembles very much the confessor and God's word preaching of (Saintly) Elder Father Georgi of Jiglarci who recently also passed away 10th of January this year. fr. Atanas alone used to say that God left him to survive until the fall of Communism in Bulgaria in order to show those who mocked him and tortured him that their regime prooved false demising (nowdays even hated by most of Bulgarian) but God's Church triumpths victoriously even though the severe trials and persecutions standing according to Christ's word that promised us that the Gates of Hell will not get over his Church. Below is a nice 15 minutes video made earlier by one of our Bulgarian Televisions (BTV) about this unique confessor priest. The Holy Scriptures says "Great are the miracles of God in his holies" and movie prooves the Bible verse another time. God forgive and remember fr. Atanas in his Eternal Kingdom and let the father pray the Lord Jesus Christ to have mercy on us the sinners. Amen. This entry was posted on Tuesday, March 31st, 2015 at 10:40 pm	and is filed under Christianity, Everyday Life, Various. You can follow any responses to this entry through the RSS 2.0 feed. You can leave a response, or trackback from your own site.